like how the marching band's bass drum takes over your chest, this. 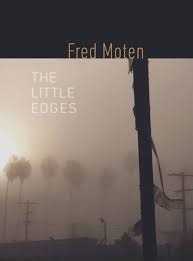 Moten’s shaped prose runs currents through scales both grand and personal in the poems of The Little Edges. He is picking apart words, phrases, chance encounters, and recurrent places fastening the people within them into a rhythm he slyly conducts. The thematic clarity of each collection rides its own current in between the lines and reflections he delicately weaves into one another. His often second person characters balance, “on the edge because you’re driven to the edge in your violent correctness,” pegged into boxes and biomes where you have your own, limited freedoms. Many of the poems take a closer look at the expression of those freedoms, taking the always present unthinkable and finding ways to sublimate from it “pleasure in abandon, tarrying, tasting in abandonment in stepping and studying why we can’t.” In Moten’s shaped prose what the mind knows the body must conceal and defy so that it can carry the mind to a place all its own. His poems are perfectly succinct and yet expanding of the edges to each box he dissects. His lyrical current moving the reader’s eye faster than than the brain can fully account. Each poem bears repeating, each chapter expands the rhythm of the one before it. It's as if the ghost of Wittgenstein got together with that of John Coltrane for a serious slam/jam session to create a book/space that transcends printed shape in order to grace your ears and eyes with an explosive fusion of lexical fireworks and musical form...this book is about as "mak(ing) it new" as it gets. "Listen to the sound through one another's skin. Preserve the sound through membrane and water, to find our form in corresponding.Your body is a mixing board."